This page considers workplace conflict resolution and how awareness of the Principles of Effective Communication can be a means of supporting conflict resolution within the work environment. Some of the sections refer to the Underlying Philosophies of Mediation described elsewhere and links are given where this is so. Other sections relate to good practice concepts that have been used within workplaces to promote learning and growth as a benefit of effective workplace conflict resolution. As an example of one of the Underlying Philosophies of Mediation that has relevance to workplace conflict resolution and effective communication, let's consider the type of relationships that might exist within a workplace. An Adult-Adult relationship will be one where all employees are considered and expected to be capable of finding ways of resolving their difficult situations, whether they be conflicts with another employee, or with a difficult situation or technical challenge. They have ownership of their own situation which includes the responsibilities they accepted in taking on their post. This does not mean that employees remain in isolation in dealing with difficult situations as the roles of other employees will also involve input into some situations via their own job descriptions, but in an adult-adult environment, each employee takes on and is expected to take on that which they are clearly responsible for. Difficulties arise however when a parent-child type of relationship emerges, by which I mean one in which, for example, an employee is considered to be incapable of fulfilling their responsibilities within their defined role and/or their relationships with others in the workplace. For example, a manager may give less or different work to an employee who is considered less able to fulfill a duty within their job description leaving more work, or more demanding work to others in the section or department etc. In such a situation, instead of dealing with the employee directly to support them in becoming more effective in their role, they are volunteering others to take on more work, not acting impartially towards them, rescuing the employee who is deemed to be less capable, disempowering the employee by denying them the opportunity to learn and develop. There are various other Principles of Effective Communication and Underlying Philosophies of Mediation not being practiced in such a workplace situation. Rather than effective workplace conflict resolution there is conflict suppression or conflict avoidance, neither of which leads to resolution. Other employees may feel resentful of the unequal distribution of workload. The resentment may be towards both the Manager for 'favouritism' and the employee for being the subject of this. 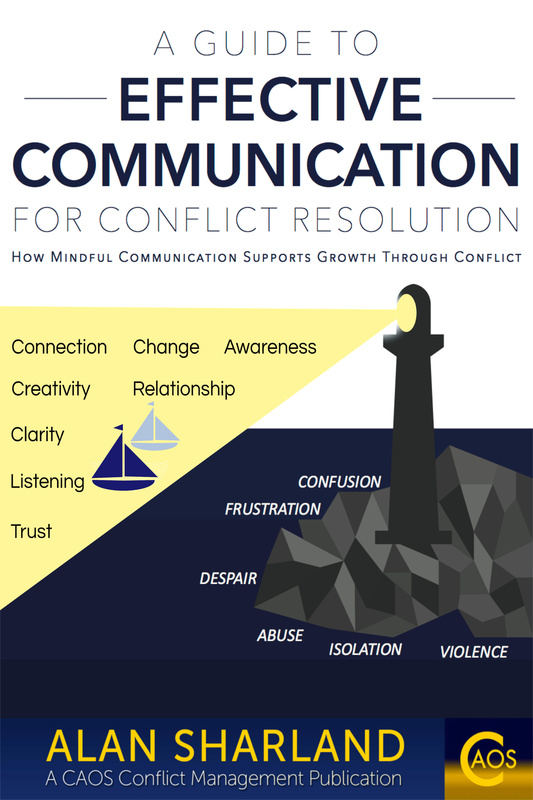 The Guide to the Principles of Effective Communication and Conflict Resolution ebook. We won't invite him / her out for a drink (as we will need to let off steam about this to each other) etc. 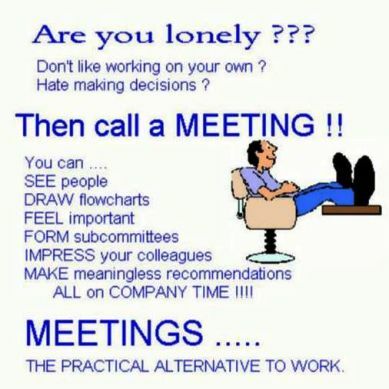 This is likely to lead to a decrease in staff morale and motivation and hence productivity. Here's a great article (click here) by Werner Erhard which illustrates many of the features of the Principles of Effective Communication - particularly that we have the right to pass, that we do not volunteer others, that we speak only for ourselves and the Underlying Philosophies, particularly that of ownership and empowerment, but also the above one of assuming an adult-adult relationship with others described on this site. This article challenges those who facilitate, and particularly those who 'direct' the training for the employees in their company to consider their approach and its ultimate effectiveness. Another consideration that either supports or inhibits effective workplace conflict resolution is the tendency towards or away from a No-blame environment with regard to difficulties that arise in the day to day operation of an organisation. The consequences of a blame environment are often to be seen when there is an ethos of 'covering your back', 'not taking risks', 'keeping your cards close to your chest', secret meetings between people, both formally and informally etc. This also tends to manifest in a lack of creativity and willingness to change within the organisation or at least within the department or section in which the blame environment is practiced. Creativity inherently requires mistakes and so an environment in which they are condemned is vulnerable to stagnation and rigidity. If it's not ok to make mistakes in the workplace then it will not be as creative as it could be. Effective workplace conflict resolution is intrinsically an opportunity for learning and creativity. However it is extremely rare that such workplace mishaps will occur for only one employee as we are all prone to making mistakes. Therefore, when it is seen that this is the way a mistake is responded to, the main activity of those associated with any difficult situation is to ensure they are not 'implicated', and for the one 'accused', the main activity is to pass responsibility to (blame) others. Hence the initial, ineffective response of challenging the person and not the behaviour is also responded to ineffectively and so the practice continually reinforces itself. Enormous amounts of time and resources are used in defending against the blame, not to mention the additional stress and impact on morale and motivation. The no-blame approach allows an open investigation into, and discussion of, the reasons why the problem occurred so that systems or policies can be put in place to reduce the likelihood of it occurring again in the future. It promotes the co-operation and creativity of employees to improve their effectiveness and the organisation's effectiveness. They are able to take more ownership of the environment they create and are empowered to do so. There is an increase in motivation and morale and as a result, workplace productivity is likely to increase. In the no-blame approach, conflict is seen as an opportunity for learning, connection and insight. Personal mastery goes beyond competence and skills, though it is grounded in competence and skills. It goes beyond spiritual unfolding or opening, although it requires spiritual growth. It means approaching one's life as a creative work, living life from a creative as opposed to reactive view point. The purpose of this website is to support visitors in achieving such an aim. The Principles and Philosophies described on this site support the creation of a choice of more effective responses to communication and the resolution of conflict, rather than reactions in which no choice is recognised to be available. The Principles provide a basis, or benchmark, for reviewing present practices in these areas and thus an opportunity to learn new ways of responding where needed. But a further aspect of Senge's quote that I very much support is the idea that it is Personal mastery and it is about our choice to own our responses and create new ones in response to difficulties. It is about recognising our ability to respond, and thus our capacity to take responsibility for those responses. However,it should also be noted that sometimes, even within a no-blame environment, an individual may protest that a mistake or mismanagement of a situation was 'beyond my control' when in fact it may have been due to the individual's ineffective time management or some other simple oversight. I make this point to emphasise that it is still our individual responsibility to adopt a no-blame approach both in how we respond to others' mistakes and how we respond to our own. The no-blame approach requires that we acknowledge our own part in a mistake, and thus take ownership of the situation and accept responsibility. If we adopt a blame approach towards ourselves we are likely to go into denial rather than be open about reviewing the things we could have done differently. There can be a clear hypocrisy in an organisation which claims to adopt a no-blame approach but it is not seen to be practiced by staff at all levels of the organisation. It seems fitting that we cannot 'blame' our managers for not adopting a no-blame approach, nor can we 'blame' our employees for not adopting it even if we try to introduce it. It then leaves it down to us to genuinely walk the talk, and focus on ensuring we practice it ourselves - if we mean what we say. Once again - effective conflict resolution is about self-awareness and not techniques for controlling or changing others. Now, let us know - What are YOUR experiences of Workplace Communication? How to Resolve Bullying in the Workplace. 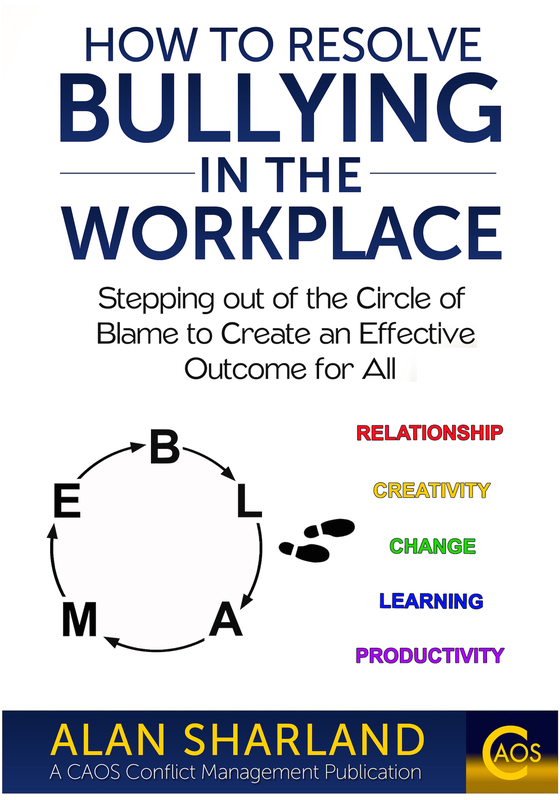 Stepping out of the Circle of Blame to Create an Effective Outcome for All.